Dax Liniere is a producer and recording/mixing engineer from Australia who recently decided to put all of his stuff in a shipping container to take his career to the next level in London. Dax’s studio, Puzzle Factory, which is an amazing facility that he designed and built, has 3 control rooms (Control Room One being in the top 2% of rooms in the world) two live rooms, machine room and workshop located in Seven Sisters. In this interview, Dax speaks about why he moved from Australia to the UK, the limitations of working in Australia, the 7-month struggle of finding a place to build his studio in, how studios can be profitable, favourite failure and much more. Why did you decide to move to the UK from Australia? It was part opportunity and part desire to be closer to my European roots. I had run a studio in Australia for 15 years and in 2012 I was awarded a Winston Churchill Memorial Trust Fellowship, a research grant with the goal of gathering knowledge to disseminate in your home country. My research project was to enrich Australian music by bringing new, culturally-diverse techniques and perspectives to Australia. It consisted of two Mix With The Masters sessions (with Michael Brauer and Joe Chiccarelli) and 16 days travelling around Europe, sitting in on studio sessions. At the end of my trip, I came to London to spend two weeks in the studio with Alan Moulder and Flood while they worked on Foals’ album Holy Fire. Around 2015, I decided that I wanted to find out what was possible outside of Australia, which was increasingly feeling more and more limiting, like I was hitting a glass ceiling. I knew I wouldn’t have been satisfied with my life if I stayed in Australia and never tried to follow my dreams. I couldn’t live with the regret of sitting around when I’m 80 thinking “I wonder what could have happened?” so I decided to make the move. So, in April 2016 I put everything I owned into a shipping container and sent it to the other side of the planet to build this recording studio here. Is there a limit in Australia as to how far you can progress? I was charging the most you can charge in Australia and I was busy with clients, but things never really ‘escalated’. The problem with Australia is not lack of talent, it’s lack of market. It’s unfortunate, but the industry in Australia tiny. On top of this, most people just don’t care enough about the arts to support them. There are pockets of people who are very dedicated to music, visual arts, dance and theatre but generally speaking, the general population isn’t interested in the arts. It’s different in Europe where art is a large part of national and cultural identity. I have worked with so many talented and incredible artists in Australia but they often go nowhere because there’s nowhere for them to go, unless they explode overseas, which is a very rare thing. There are very few ways for musicians to make a living doing what they are good at and as an engineer and producer, your success is tied to the success of the artists you work with. If you haven’t worked with a band who has been lucky enough to get a big break, no matter how great your work is, you’ll continue to go unnoticed. Since more and more studios have been closing down for a long time now, what made you think that you could do it and was there ever any doubt or fear if you could pull it off? I’m very dedicated to everything I do and I think what I do is different enough and of a high enough quality that it stands out. You mentioned that you did a lot of research before you opened your studio here in London, such as what rate you can charge, rooms to rent, etc. Could you take us through that process and what you found? Before I made the move, I had been in touch with a lot of commercial property agents. They told me that many businesses take the opportunity around Easter to move premises so at that time there would be plenty on the market. This was not the case. Having done so much research in the lead-up to moving from Australia, I expected to find something within a month, 3 months at most. I had made that my full-time job for that entire period of time. Instead, it took 7 months to find this space. Every single day I was on the phone to agents, meeting agents and looking online. I couldn’t find anything in a good location that had enough space to do what I wanted to do and didn’t cost a million pounds a week in rent. Those 7 months were very disappointing but in the end I found the right place. Our location is only 5 miles from the centre of London with really easy access and also close to parks and the canal. Did you also do a lot of research in which artist you can work with here and how you were going to make a living having a recording studio in London? In Australia, I was already quite busy as a producer and recording/mixing engineer. In 2013, I increased my rates by over 30% and I went from being busy to busier than I’d ever been. However, in London, I'm the new guy in town. Artists have established connections with other engineers, so it’s a matter of putting your name out there. What has your tactic been to get the word out that you are here now? Networking has been the most important aspect but also social media, which I think is the way nowadays. The reason I was so busy in Australia was reputation. If you dedicate yourself to the project and do great work for the artist, people will always say positive things about their experience. Then those artists talk to other artists, who in turn talk to others. It grows exponentially. How important would you say patience is in this game? The amount of patience required is equivalent to how much you ‘want it’. A recent example, a super-talented band put a whole lot of effort into creating and releasing an incredible project, but it didn’t launch them forward as they had hoped. They tried to make the band work over a period of years, but in the end decided to wind up the band. It was a real shame. But if you really want it, you don’t give up. How did you get your career started in Australia? I had been in a couple of bands myself and when I was 16 years old I had saved up all my money to buy a 2 channel sound-card, which was very expensive at the time, but in hind-sight, not that great! I built myself a 2 channel microphone preamp and got a couple of second-hand microphones. My parents also offered me half of our home’s garage to set up a little studio and I would spend all my money on audio equipment. In high school I was recording my friends’ bands using a 58 on the kick drum and one 58 above the kit. Then we would multitrack the other parts in my bedroom. While working in an office in North Sydney, I found myself thinking more and more, “I hate this job, why don’t I try to make something out of this whole studio thing? I’ve got enough gear to start and the drive to succeed, so why not give a shot?” And almost 20 years later, here we are. You did a small business management course, how helpful and beneficial was it do that course? Very much so. Understanding how accounting and taxation works is important so you can plan your expenses because as a business you have a lot more to be responsible for. I would recommend that line of study to anyone who is looking to run any kind of business, not just a studio business. What do you think it takes for a studio to be profitable these days? Quality of product and quality of service. You must be putting out the best quality of product you can every time, not sometimes. To make it, you can’t have an off day and you need to be really strict on yourself. The other thing would be to do something different because there are plenty of studios out there, especially in London, so it’s important to stand out. Control room 1, which is your private mixing/mastering suite, is in the top 2% of rooms in the world, what did it take to build that? It starts with design and that’s why I worked with Jeff Hedback of Hedback Designed Acoustics who has done some fantastic rooms. He’s a true professional who knows how to design a great sounding room. He understands the science behind it, but appreciates that there’s an aesthetic side to it, too. My advise is don’t ‘cheap out’ on materials, and this comes back to paying attention to detail. For example, there are three sheets of material on the inside of every wall and two sheets of material on the outside on every wall. Every single one of those sheets has acoustic mastic (sealant) around every edge. It’s a laborious process, but it’s worth it. You built this room specifically around the Duntech Princess, why these speakers? The first time I heard a pair of Duntechs was at my friend’s mastering studio, Jack The Bear in Melbourne, Australia. I thought I knew these reference tracks inside-out and back-to-front, but on the Duntechs it was like hearing these songs for the first time. I heard things I had never heard before, even though I’d heard those songs hundreds of times before. Listening on Duntechs felt like someone had lifted a veil between me and the music, I could hear every single detail. It’s quite an experience. Then and there I decided one day I would own some. We have Duntech Princess in Control Room One and Duntech Marquis in Control Room Two. For someone who has a small budget, should they spend it on their room rather than gear? If you have been doing this for a little while you probably have everything you actually need in your computer. What you really need next is to be able to hear what you are doing, so faithful monitoring is key. What many people overlook is the acoustic treatment of their room. It doesn’t have to be a full-fledged set up like this. Hell, I’ve mixed great-sounding records in bedrooms. Putting acoustic treatments on the walls can take you a very long way. Especially small rooms, you want to dampen them down as much as you can. You have put a lot of work in the studio and a lot of focus is on the details of the rooms which is very noticeable. Did you also put the same focus on the functional side of the studio? In the back of my head I had been planning this studio for about 15 years. Every time I would go to a studio I would pick up on things that are really good or really bad, and all of those experiences contributed to the design of this studio complex. I do a lot of software beta testing and my main thing with plugins, besides audio of course, is UI and UX. They are really important elements to me, though not just with plugins but with all design. The functionality of each space was factored-in very early and I wouldn’t commit to any facet unless I felt I had carefully and fully considered those aspects. 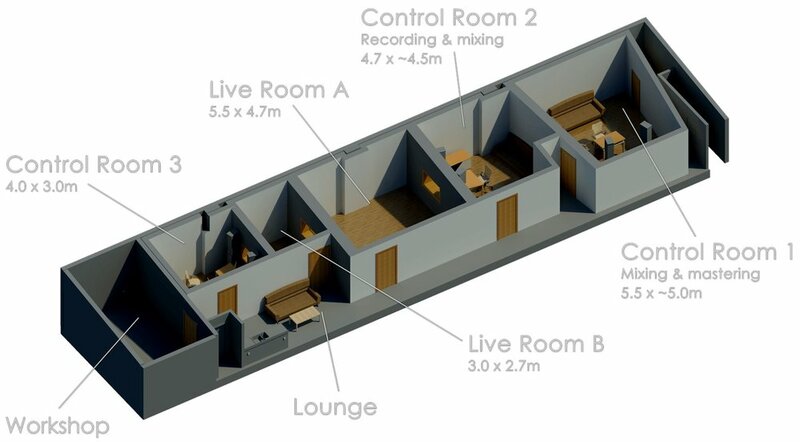 For example, Control Room 2 and Live Room A are two adjacent rooms, so when you are recording you will be walking between those two rooms most frequently. To make this as smooth as possible I made the doors opens outwards from each other so you don’t have to open one door and walk around it to get into the next room. Instead, you open one and walk straight into the next room. Like a horseshoe. What has been your favourite failure? Not securing producer management in Australia. That was the last big thing that prompted me to change my focus and move abroad. My dear friend and mentor Greg Simmons helped me to see that I was never going to achieve what I wanted if I kept following the line I’d been on. Also, I had been looking to set up a facility like this in Australia, but there were numerous deals that fell through due to various local arts foundations not pulling their weight or having very narrow-minded views of the arts. Had those operations come to fruition, they would have anchored me to Australia. There have been many things that were huge disappointments at the time, but turned out to be blessings in disguise. They prompted me to set my sights on bigger goals. How do you handle the quiet times when there's not much work coming in? There’s always something for me to do, I’m always thinking of little workflow improvements for the studios, but mostly spending that time working towards getting work, networking and marketing. Thanks Dax and to you happy readers, let me know in the comments below what you think and if you have any questions!